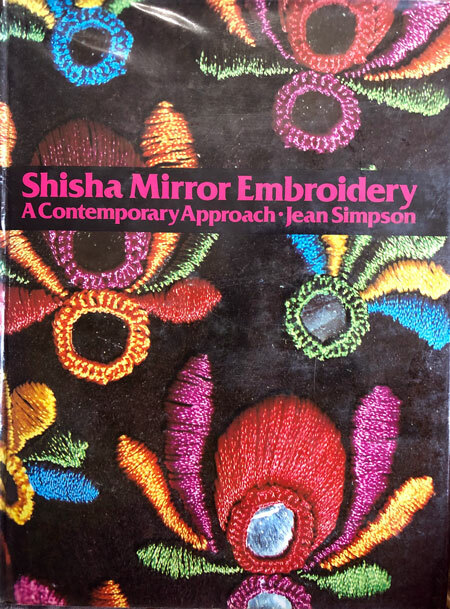 “Shisha Mirror Embroidery, A Contemporary Approach” by Jean Simpson. 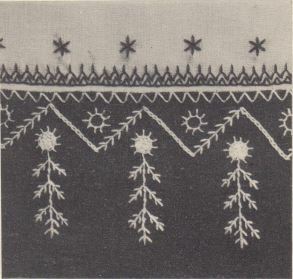 As you can tell by the title, this book is about incorporating mirrors into your embroidery, specifically the technique that is commonly known as shisha embroidery, in which the mirrors are held down only by stitches. 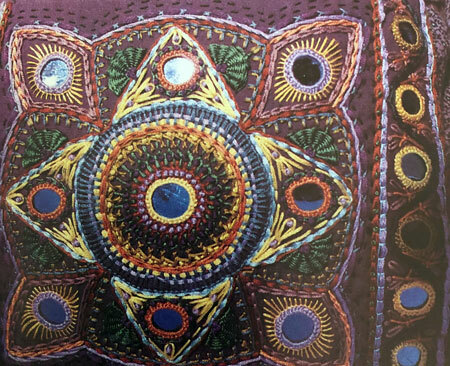 The book begins by covering which types of mirrors and fabrics will work the best, then goes onto techniques. There are ten different ways to attach mirrors, including the traditional method and even one that creates three dimensional shapes with padding underneath. Each method has a set of step by step instructions and drawn illustrations, making them easy to follow. These instructions are what grabbed my attention when I first found the book, but they’re just one of the really interesting things I found that I’ll use. Next up are accessories, including everything form handbags and purses, to hats, socks, and shoes. 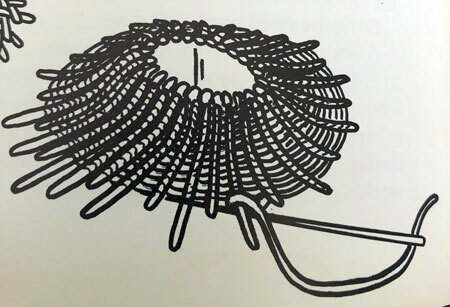 Whilst this chapter does include some projects, the instructions for many are quite minimal compared to today’s project books and are most useful for inspiration and a supply of motifs and designs. 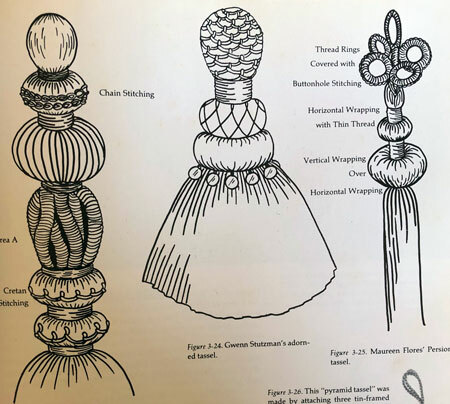 This chapter finishes with several pages of instructions and inspiration for making decorative tassels, some with mirrors and some without. 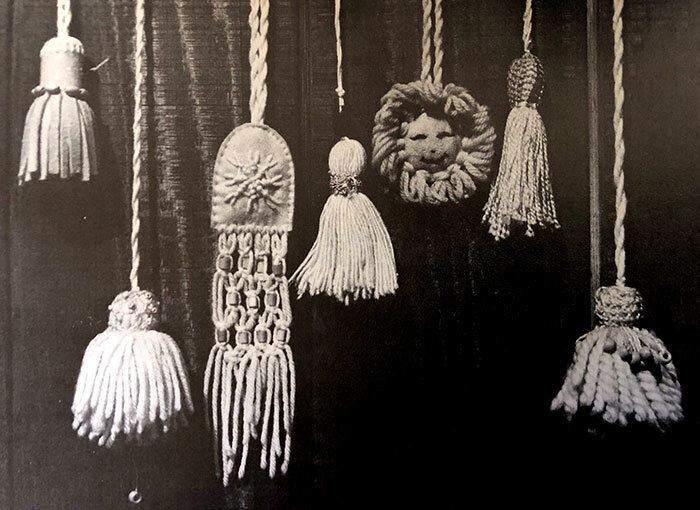 The styles of the tassels range from simple, to almost 3D sculptures in their own right, and would be a great addition to the chunky woven wall hangings that are popular today. Chapter four, “Interior Reflections”, is an inspirational chapter with sample projects using techniques to inspire your own work. It covers different types of pillows, chair pads, quilts, banners, boxes, and holiday decorations. My favourite project among these is a banner of a smiling sun, with the most amazing tassels hanging from the bottom. (see the gallery below for a photo). 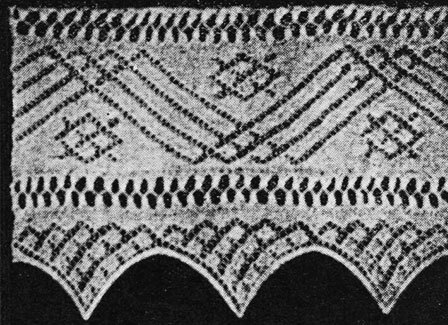 Previous chapters have concentrated on creating larger designs by repeating small motifs or making art pieces with asymmetrical designs. This chapter concentrates on larger designs, with a symmetrical look. It includes five designs that you can trace or enlarge, with details on the way the designer embroidered them., plus lots of photos for inspiration. Chapter 6, Mirrors with Needlepoint. 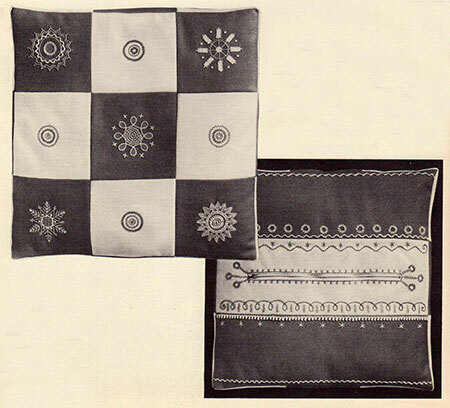 Some very dated needlepoint pieces here, but if you can look past the designs you’ll find a few tips on working mirrored embroidery on needlepoint fabrics. The last chapter is only two pages long, but I wish there was more! 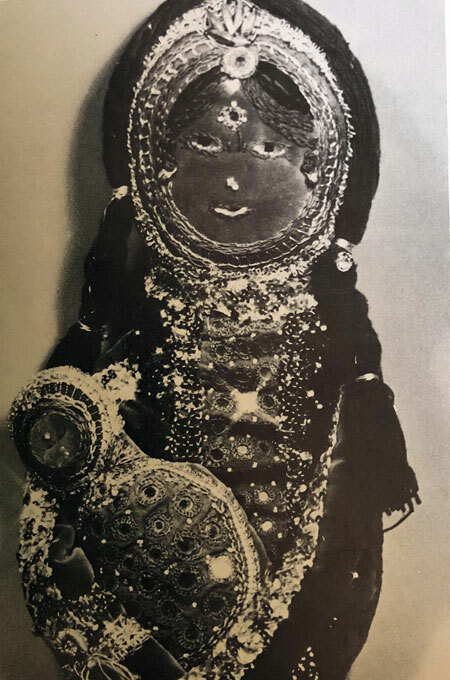 This chapter is a very quick look at some embroidered art dolls that have mirrors on them. They’re all quite different and a good source of ideas for using mirrored embroidery on any 3D soft sculpture. Shisha Mirror Embroidery is full of designs to try on any project you like, from small, single mirror designs like these to much larger designs. Padding is used to create a three dimensional form with a mirrored centre. 1970’s men’s shirt and flares with mirror embroidery. “Madonna and Child” by Maureen Flores. Tassels take all forms from classic (centre), to freeform and wild. 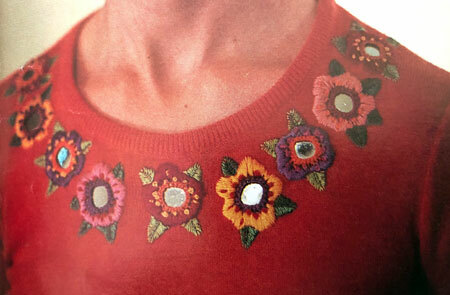 The neckline of this jumper (sweater) is decorated with embroidered flowers with mirrored centres. 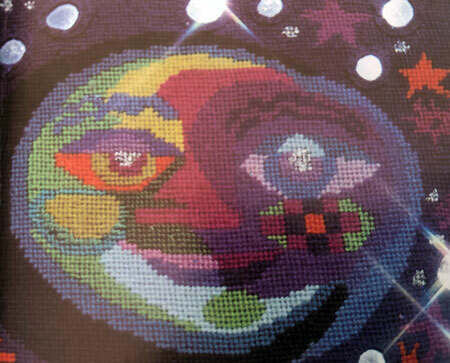 “Moon” needlepoint. Designed by Kay Whitcomb and stitched by Diane Powers. I really love this book, but the few copies that are available online are quite expensive. If you’d like to learn shisha and mirrored embroidery without forking out US$20 (or more) + postage for this book, check out shisha embroidery on YouTube, where you’ll find a huge number of tutorials. But make sure you walk the dog, grab a cuppa and a snack first because you’ll be there for days. 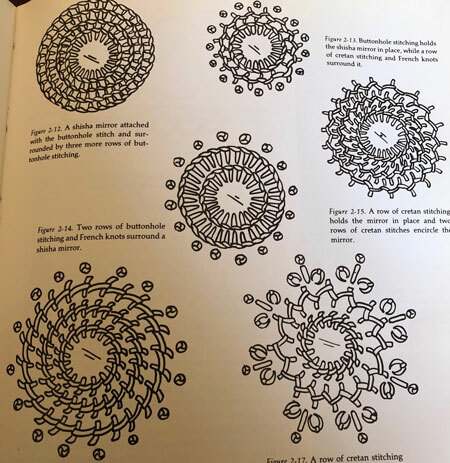 If there’s a vintage embroidery book you’d like me to review, please let me know, and if I have it, I will! As always, if you’d like to be notified of new posts and patterns via email, sign up over there on the left (on desktop), or underneath this post on tablet and mobile. Happy stitching! This week, our And So To Sew bulletins are all about learning techniques for both sewing and embroidery. 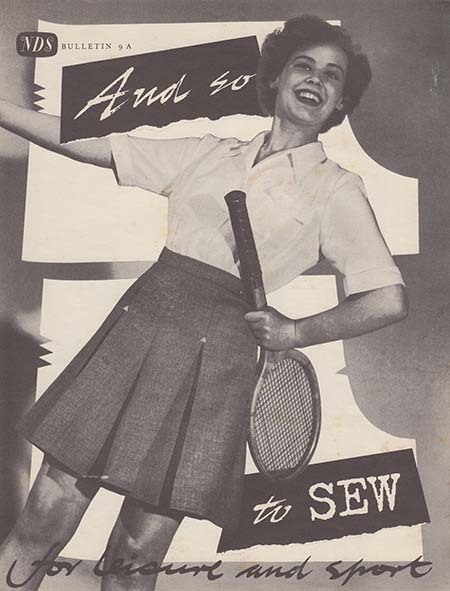 “And So To Sew” leaflet 9a is all about techniques that are used in the sewing of vintage sportswear. Every technique from making the pleats of a classic sports skirt, to matching patterns, finishing seams and hems and reinforcing garments at stress points. “And So To Embroider” bulletin 9b teaches us all about embroidering on wool. 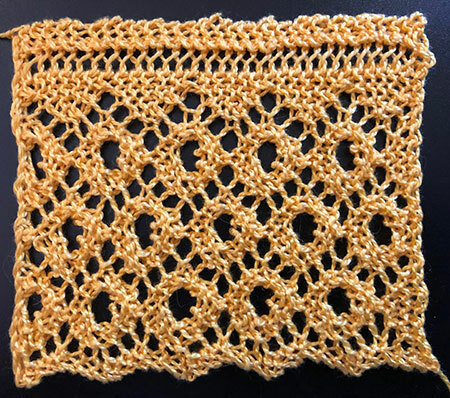 It also includes three new stitches, how to use them to design motifs, and some project ideas to embroider them on. As always, I have included a selection of video and photo tutorials for each technique as we all learn differently and not all of us have a teacher close by to help if we get stuck! 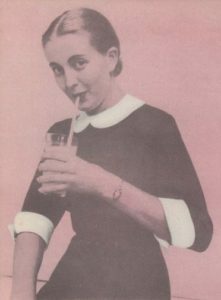 I hope you are enjoying this series of 1950’s leaflets from the Needlework Development Scheme. We have a way to go yet, with some of my all-time favourites coming up! If you’d like to stay notified when new things are posted, sign up to be notified by email (over on the left on desktop, or under the post on tablet or phone). You’ll receive a short email with information on the new post so you can choose whether it’s something you’d like to look at. At the moment, that will be three emails per week.